Discover four world-class wineries within 15 miles of each other, reveling in exceptional wines and breathtaking views. Taste of Chalk Hill Road is an all inclusive tasting experience where guests visit four properties, taste through four flights and enjoy a seated lunch. Each of the four wineries is highly acclaimed, family owned and offers distinct tastings and experiences. 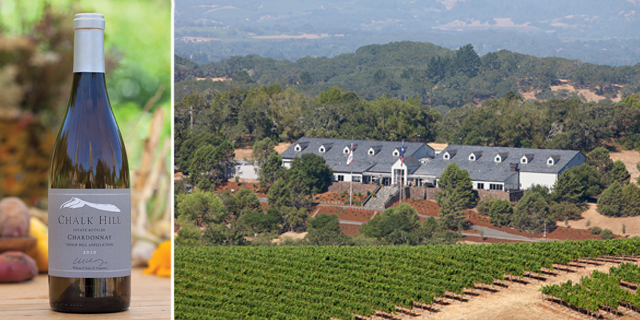 Taste of Chalk Hill Road is a day of immersion into quintessential Sonoma County! Guests who book this experience sit back and enjoy a convenient and concentrated wine tasting experience which includes a delicious lunch and a diverse portfolio of award-winning wines. This day is simply a once-in-a lifetime tasting adventure you cannot miss. The journey starts at the elegant Chalk Hill Estate, one of Sonoma County’s benchmark producers. Relax with a flight of four estate wines while taking in the beautiful scenery of the 1300-acre estate vineyards. Don’t miss Chalk Hill’s flagship wine, the 2015 Estate Chardonnay which recently received 93 Points from Wine Spectator (February 2018). Continue the day across the street at Roth Estate, a winery dedicated to crafting exceptional quality wines grown in the best of the Alexander Valley AVA and Sonoma Coast AVA. Their wines are bold and unapologetic. Here, you’ll taste a flight of four wines and savor a delightful lunch out on the patio. While you’re here, you’ll want to sample their flagship wines, the Roth 2015 Alexander Valley Cabernet Sauvignon which was awarded 91 points from Wine Spectator (January 2018). Travel just down the road to the stunning Lancaster Estate in Alexander Valley with its sacred caves and rolling green hillsides. Indulge in a flight of four estate wines and marvel at the spectacular views of Alexander Valley vineyards. Don’t forget to try the Lancaster 2014 Cabernet Sauvignon which received Wine Spectator Top 100 Wines of 2017 and 94 points! The final stop is to one of the most architecturally stunning wineries in Alexander Valley, Foley Sonoma. Enjoy a flight of 4 wines while taking in the surrounding estate vineyards and the picturesque Mayacamas mountain range. Enjoy their wines –­ bold, free-spirited, rich in fruit and deep in character! The Taste of Chalk Hill Road experience runs approximately five hours for $155 per person (plus tax). To book the Taste of Chalk Hill Road Tour experience, contact (707) 657-4859 or experiences@chalkhill.com. This experience does not include transportation, but the concierge is happy to offer recommendations.